Becoming Riflemyn, 44 page staple-bound pamphlet/zine. The Riflemyn is capable of hitting 20 targets from 500 m with standard, rack grade equipment and ammunition. The Riflemyn does not rely on special equipment for marksmanship, but on skill and knowledge. The Riflemyn is non-aggressive, patient, hesitant to use a rifle. The techniques explained in this pamphlet will help you to become a more competent riflemyn with out having to fire a single shot. Learn the basic concepts of Natural Point of Aim (NPOA), Minute of Angle (MOA), Zeroing Your Rifle and Cadence. 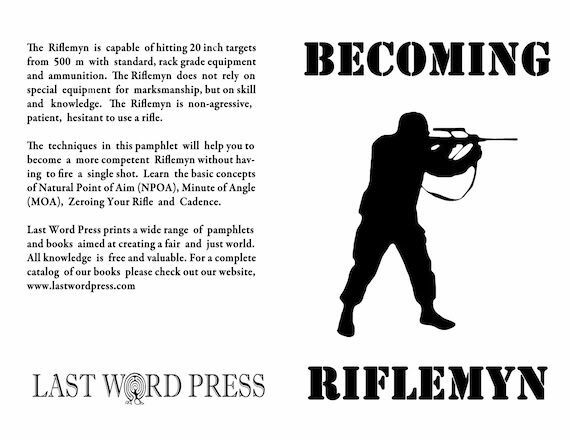 Becoming Riflemyn, 44 page staple-bound pamphlet/zine. The Riflemyn is capable of hitting 20" targets from 500 m with standard, rack grade equipment and ammunition. The Riflemyn does not rely on special equipment for marksmanship, but on skill and knowledge. The Riflemyn is non-aggressive, patient, hesitant to use a rifle. The techniques explained in this pamphlet will help you to become a more competent riflemyn with out having to fire a single shot. Learn the basic concepts of Natural Point of Aim (NPOA), Minute of Angle (MOA), Zeroing Your Rifle and Cadence.